Compressor had to be shut down due to extensive vibration leading to the discovery of a crack in the keyway of the impeller. Upon further inspection of the impeller, crack was found inside of the hub and erosion detected on the outside blades. 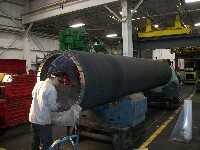 Weld buildup required due to material erosion on the outside diameter. Completed repair and ready for harmonics test, balancing and over-speeding.